A failed retinal detachment surgery a couple of years back resulted in complete vision loss in the right eye for little Nima Elmi Said of Somalia. When she complained of similar symptoms in her left eye, her family became very apprehensive and wanted only the best treatment for her this time. 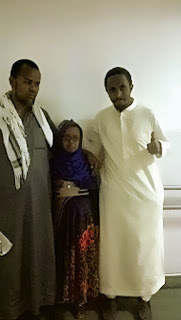 “A doctor friend in Somalia convinced us to seek treatment at LVPEI. Our fears were put to rest when we interacted with Dr Padmaja Kumari Rani and had first-hand experience of the systematic manner in this hospital,” says Mohamed Salah, Nima’s uncle. Nima successfully underwent a retinal detachment surgery on the 3rd November 2016 and is making good progress. The family is thrilled that Nima will no longer have to live a life in darkness and will be able to continue her studies. “For future consultations, Dr Rani has even connected us with a specialist in Kenya who has been trained at LVPEI, so we won’t need to come all the way to India every time. This is surely more than we expected!” says the delighted uncle.